Wikileaks is in news………. Of sickening money scandals, the involvement of Congress politicians; that there were three assassination attempts on Sanjay Gandhi, amounts were paid to LTTE by Govt; they pressurized the then CM Karunanidhi and …more…. all news from ‘Wikileaks’, an International, online, non-profit organization which publishes secret information, news leaks and classified media from its own anonymous sources. This post has nothing to do about these leaks………but concerned with another leak. 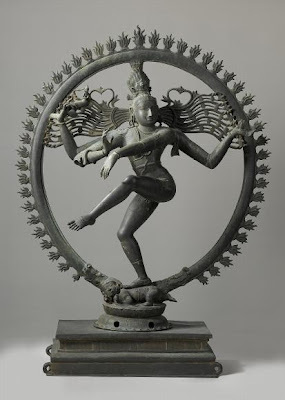 Hinduism believes in idol worship…… In Jan 2012, I had posted about the beautiful Nataraja idol [not in any temple] but in a museum in Amsterdam… At 153 cm x 114.5 cm, the Rijksmuseum’s Shiva is the largest known bronze statue from the Chola Dynasty (9th to 12th century) kept in a museological collection outside of India. There were reports that the thousand year old temple statue was X-rayed, and found that it was not hollow but fully cast in bronze. This great piece, the 12th-century Shiva Nataraja is on loan from the Vereniging van Vrienden der Aziatische Kunst(Association of Friends of Asian Art). Chennai: An ancient Nataraj idol, smuggled from a Tamil Nadu temple and in possession of an American art collector then, was the subject of a series of cables exchanged between the US Govt., its envoy in India and the Chennai consulate in 1974. As Tamil Nadu was making efforts to bring the 10th century bronze idol, discovered in a village in Thanjavur district in 1953 and taken out of the country in 1956, back ,US officials expressed doubts whether the issue could ever be resolved, reveal cables released by WikiLeaks. The idol was finally brought back in 1987 and has been kept in the vaults of Kapaleeswarar temple in Chennai ever since. But before it was sent back, the art collector, Norton Simon, was allowed keep it in his custody for 10 more years .A parallel can be drawn with the recent case of international antique smuggler Subhash Kapoor. While Kapoor,an Indian born US citizen who was running a museum of antiques in New York, was brought to India to face trial on charges of smuggling prized idols from TN temples, Simon not only got away with the possession of a smuggled idol but also got to keep it for some time after the matter came to light. The first reference to the negotiations between India and the US on the idol can be found in the cable sent by US envoy Daniel Patrick Moynihan to the state department on March 22,1974. Idol row with US settled out of court: It said : When I saw Teja (referring to an Indian official ),I reviewed the status of the Nataraj matter. When I noted the scene for Nataraj discussions seemed to be Washington rather than New Delhi, Teja commented that any final agreement will have to be approved by the ministry of education in New Delhi and the TamilNadu government. It indicated that the US administration was not keen on Simon coming to India for talks. I noted that when certain problems had come up on the Nataraj question, we had concluded it was best to resolve these in the US before considering a Simon visit, Moynihan said in the cable. With the DMK in power in TN and the Congress at the Centre, local political sensibilities appear to have weighed on US officials in India on how best to handle the case. In a communication with the consulate in Chennai on March 25, Moynihan said : We continue to be wary of the extent to which the Government of India is on board in all this. We suggest you try to feel out on the degree to which the Tamil Nadu government has been consulted. The Tamil Nadu government, an opposition establishment, may try to embarrass the Indian government with tougher demands, he said. We call ourselves biggest democracy, yet so much seemingly happened behind the scenes ~ Temples are looted in every possible manner; idols are stolen; smuggled out of the country ~ and so much happens in the background that the crime doer is allowed to walk scott-free………… shambolic.. that an idol reverred and worshipped by us was smuggled, and kept out in a foreign country devoid of rituals and offerings, should make the heart of believers’ bleed.